Your View can contain tiles of several types. For more information on the tiles which you can use on here, see Your View tile reference. Click the icon in the main navigation menu. Click Your View in the left sidebar to open the Your View page. Click Edit page in the upper right corner to open the Your View page for editing. In the dialog box, select a category on the left, and select the tile that you want to add on the right. Note: Note that the list of tiles that appears for selection is different for wide and narrow columns respectively. Once added, these tiles can be moved vertically within the same column or removed within the layout as required. If required, configure the tile by clicking the gear icon at the upper right corner of the tile and adjusting the tile parameters, and then click Apply. The tile is added to the page. 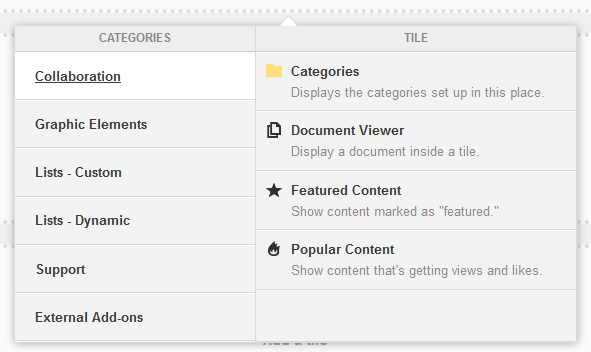 If required, adjust the tile position in the layout column by using the arrows in the upper right corner of the tile. With the changes saved, Your View displays the information you want to have on hand.